All new packaging, but same great ingredients! Please note, you may receive either of these bottles while we update our inventory. 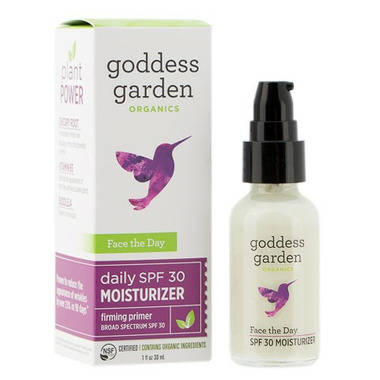 Goddess Garden Face the Day is a three-in-one facial moisturizer, firming primer and sunscreen that protects, repairs and readies your skin for the day, in one easy-to-use product. This formula hydrates, firms and protects your skin from wrinkles, roughness and dark spots that come from daily sun exposure. When worn with Goddess Garden's serum, tests showed wrinkles were reduced by 23% after just 90 days! Plant-based ingredients like buddleja and vitamin B3 lessen the look of sun damage, while chicory root provides an immediate firming effect, making Face the Day ideal worn alone or as a makeup primer. Amazing! I have extremely sensitive skin and even medical grade sunscreens "for ultra sensitive skin" break me out. This one does not and the ingredients are excellent! I love this product. A small amount goes a long way and I didn't find it sticky or cakey. I like that the ingredients are natural and that it's an SPF 30. I will purchase again. This product is average at best, good for summer with no other makeup on, other then that it feels greasy with another natural foundation on, but not moisturizing enough for winter. Just ok in my opinion! I love the fact the product is organic, but it is not the organic product for me. My daughter bought this for me and I love love this product. Only wish in came in a jar instead of a pump. Pump already not working and have to dig it out. Product itself is awesome. Ooo boy, this is just, not good. I was excited to try something with such a high zinc content but it has some pretty big fails. It is very hard to spread and to spread evenly, very streaky. Tacky, not necessarily heavy but you'll still feel it on your skin all day. I was able to apply a BB cream over it without too much trouble but good luck if you like to use powder products causes them to cake up pretty horribly. Also quite expensive at regular price although I do like the glass packaging. Love this product! Works great as a primer, makeup goes on smoothly, and it has SPF which is hard to find in a good primer. Smells nice and has a light consistency. I only need two pumps to cover my whole face. I looooove this product. I use 3 pumps to adequately cover my face and get the right level of spf. It blends beautifully. Itâ€™s a bit tacky, but I havenâ€™t had any trouble blending either powder or liquid foundation on top. I still use a setting spray to extend the staying power of my makeup. Will repurchase for sure. Perfect facial sunscreen! Works great as a primer. love that it has SPF 30. I've already noticed less hyperpigmentation from using the SPF. It is not greasy and makeup goes on over it just fine. I will definitely order this again! I am on my second bottle of this. I love that it has a substantial SPF, and it gives my skin a nice glow. The smell is a bit off-putting but it goes away afterwards. A little goes a long way. It hasn't irritated my skin and I think it has helped with my complexion. My skin has never been smoother. It is an item I will be repurchasing. I only use mineral sunscreens but I don't care for this at all. I find it heavy and sticky, and I can't apply foundation after I use it. I don't like the added fragrance either. Size of a bottle is a bit small. But you may like it if you love the smell of 'Lavender'. Also, I only do 1 pump which covers my whole face and I don't feel too greasy. Love it! Light weight, great for under make up and awesome sun coverage! Smells fresh and clean! My new favourite! Love this stuff! Absorbs really easily and feels great on my skin. Seems to control oil quite well. Fantastic product! Really nice and light! Great under makeup! Excellent also for light weight feeling yet great sun coverage!